Our most popular Foundation Level course, the Five-Day Intensive Series combines both the Introductory and Intermediate classes into a one-week course that makes up Classes 1-9. This series gives the student a mastery of nine different designs, as well as a buying trip to New York’s wholesale flower market on West 28th St. Each successive class strengthens previously learned skills and techniques and it builds to a comprehensive understanding of the industry’s best practices. FlowerSchool New York promotes a flower shop-like environment where participation in conditioning flowers is required. Students will learn presentation and preparation skills to prepare flowers for display in a real flower shop setting. Finally, students will learn the importance of leaving the design space clean and prepared each day for the following day’s work. Included in the tuition are: A FlowerScool New York work apron, florist’s clippers, a florist’s knife, a FlowerSchool New York notebook, FlowerSchool New York Handbook & Recipes, the vessels and the beautiful floral arrangements that are created in each class. Students who take this series are generally looking for an opportunity to take a concentrated schedule of classes in order to learn Introductory and Intermediate level skills. This way the students fully immerse themselves in floral design and learn the daily activities of a productive floral designer. The first class of this series will introduce the basic structures and principals of floral design. Students will learn how to select roses for freshness and color, how to properly use the florist knife and why it is important, and how to clean and condition roses to help the flower last as long as possible. Students will accomplish and learn the ‘Criss-Cross’ technique with hard-stemmed roses. This technique is an essential design mechanic in most design styles. This class will overall teach students how to make a graphic bouquet where the stems are an important part of the design. In this class students will learn the characteristics of soft-stemmed flowers and the differences between hard stemmed flowers. This entails different flower care and design methods. Students will learn how soft-stemmed flowers grow and who grows the best varieties. As well as how to properly condition soft-stemmed flowers so they hydrate and last as long as possible. Students will accomplish a graphic design style learning how to manipulate the stems, selecting the correct vase and knowing how many flowers to use. After working with mono-floral (single type of flower) designs, this class will discuss the methods of combining different types of flowers together for centerpieces. Design concepts including size, proportion and balance will be discussed. Conditioning harder stems such as hydrangea and other seasonal elements will be introduced. In this class students will learn how to properly use Oasis while keeping the design looking more natural and organic. This class will also demonstrate how to use different types of vessels for the same composition and how a container can change the overall design style of an arrangement. Class Four is a fresh and contemporary take on a traditional look- the Hand Tied Bouquet, which is a popular and necessary mechanic in floral design. Students will learn the principals of this design style and how the look can be reminiscent of a Dutch still life painting. Focusing on mechanics, the class will learn how to construct a hand tied bouquet and how to evenly distribute elements with stems going in the same direction. Students will learn which flowers are suitable, how to condition those flowers for longevity, and how to create an organized, balanced and beautiful hand tied bouquet. Like a chef, knowing where your products are coming from and how to purchase flowers is an essential part of the business. In the morning (meeting at 9:00am) students will visit the New York Flower Market to learn about the business of floral design and purchase flowers for the next set of classes. In this meet-up, students will learn where flowers come from, best practices for purchasing flowers at the market and how to best speak with wholesalers. 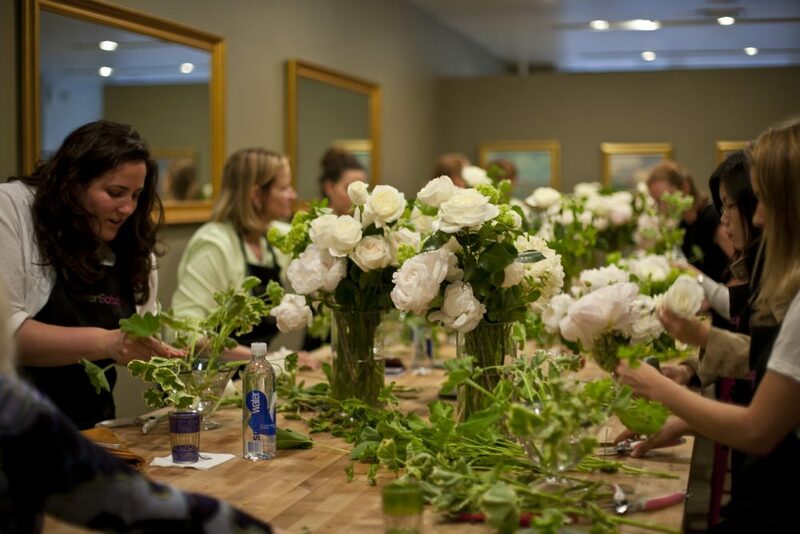 * Upon returning to FlowerSchool New York, together as a group we will discuss the morning’s activity reviewing the the advantages and disadvantages of the market and how to diversify your buying practices. In a group we will learn how to price flowers and arrangements for retail sale, and how to determine a designer’s margin of profit on a design. *This meet-up is not required, but highly recommended and is a highlight of this week’s course. A FlowerSchool New York representative will meet the class at 9:00am in the Flower Market. The ‘Flower Market Review and Floral Pricing’ Exercise will begin at the school at 11:30am. Gift or centerpiece designs are a large part of floral design. In this class students will build upon their knowledge from previous classes introducing new techniques. Students will learn how to make two monochromatic low centerpieces in a 6″x 6″ and a 3″x 4″x 6″ glass vase. This will be an advanced study of the crisscross/ grid technique learned in Class One; here we will introduce different types of flowers and learn to properly layer flowers by shape and size. This class will also include an introduction into color theory; learning how to choose the right seasonal flowers and understanding the subtleties of colors in the floral palette. Finally, we will introduce methods for wrapping and decorating the vase for a more modern and polished look. Advancing from the Hand Tied bouquet learned in Class Four, the bridal bouquet is a more intricate and detail-oriented technique that is highly sought after in wedding work. In this class students will learn the characteristics of bridal bouquets and the different popular styles & trends. How to improve upon the skills learned in Class Four to make a more polished, professional, balanced bridal bouquet, and how to add ribbon treatment of various styles and techniques to complement the total design. Using seasonal elements such as branches and flowers, students will learn how to put together a large-scale arrangement that is suitable for an entry way or a bar. The typical size of these arrangements is 4 ft. and higher depending on the season. In this class students will learn how to properly condition branches for longevity and how to position them in a design using proper proportions for larger scale vases. Introduction to Tablescaping. In this class students will learn how to coordinate the entire look of a table including the silverware, candles and of course flowers. We will create two different looks or design styles to demonstrate how the flowers and decor can change the environment. Students will learn how to gauge the height and dimension of flower arrangements to work within sight lines, how to keep multiple arrangements similar to achieve a coherent and overall look and to maintain consistency of theme and concept according to the event or client’s request. The Five-Day Intensive Series is designed to be taken as a series of nine classes, and includes a buying trip to the New York Flower Market.